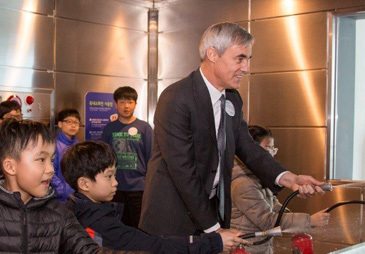 Mr. Bill Miner, Korea country chairman of Chevron, is participating in the safety drill with children. SEOUL, S. Korea (March 24, 2016) — Chevron, one of the world’s leading integrated energy companies, held “Safe Nuri” (Safe World) safety education drills for children at Boramae Safety Center in Dongjak-dong, Seoul, South Korea. "Safe Nuri" is a national education program designed to protect children in childcare centers from unexpected crises and to promote safety awerness and preparedness. Chevron has supported the program in partnership with the Community Chest of Korea and Nationwide Childcare Center since 2015. This year, children were given opportunities to participate in safety education drills at training facilities, specially designed to simulate crises including earthquakes, typhoons, fire, and car accidents. During the drills, the children were able to learn practical emergency response skills from safety experts. The "Safe Nuri" education program targets 4,590 children and social welfare specialists in 153 childcare centers in Seoul, Gyeong-gi, Incheon, Geoje, Ulsan, Busan, Tongyeong, and the Yeosu area. The safety and emergency rescue training by safety experts will be conducted through August. Safety tool kits including fire extinguishers, fire alarms, first-aid kits, and safety posters will be provided to childcare centers and a certificate of "Safe Nuri Education Program" will also be issued to training participants. Chevron is one of the largest U.S. investors in Korea through its nearly 50-year joint venture, GS Caltex. Chevron also contracts with Korean shipyards and fabrication yards in Geoje and Ulsan to construct oil and gas exploration platforms, as well as ships used to transport LNG, crude oil, and petroleum products. Chevron is one of the world’s leading integrated energy companies, with subsidiaries that conduct business worldwide. The company is involved in virtually every facet of the energy industry. Chevron explores for, produces and transports crude oil and natural gas; refines, markets and distributes transportation fuels and lubricants; manufactures and sells petrochemical products; generates power and produces geothermal energy; provides energy efficiency solutions; and develops the energy resources of the future, including biofuels.